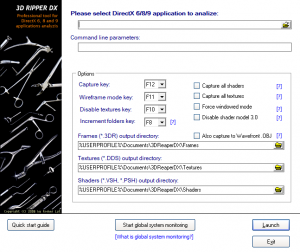 3D Ripper DX is a free model ripping tool made by Roman Lut, a.k.a hax. The tool can capture geometry, textures and shaders from DirectX 6/8/9.x renders on Windows x86 architecture. These captures can be imported into 3DS Max v5.0-9.0, 2009 and 2011 with the accompanying plugin. and these values must be supplied to the plugin in order to correct the capture. Alternatively the tool can be set to capture geometry in Wavefront OBJ format, though this limits the ability to correct the skew. The tool can also disable texture rendering and force a wireframe view. Roman has since ceased development on the tool due to lack of interest. This page was last edited on 9 September 2018, at 17:59.